Jawa Factory Magazine November 1934. Jawa Factory Magazine January 1941. Svet Moturu Issues 8,14,15 – 1954. 2 x CD of Czech Motor Review from 1962 and 1963 (Missing issues from Club’s collection). Some additional Czech Motor Reviews via Australia. Motor Cycle World December 1968 – Road test of Jawa 250 California and CZ 250 Trials from eBay. Classic Racer - Winter 1983 - The Bill Ivy Story (with Jawa 350cc V4 on cover). Motorcycle Mechanics - March 1976 - CZ 175 versus Jawa 350. Bike - January 1979 - Jawa 350 versus MZ and Honda. Motorcycle Sport - 1981 - South by Jawa 350cc Model 634. Trail Bike Quarterly - Autumn 1972 - CZ 175 Trail Boss (482) and Jawa 90 Cross (Australian). Motorcycling - September 1960 - Jawa 350cc Senior Model 354. Motorcycle Mechanics - March 1975 - CZ 250cc. 97 Czech Motor reviews (Donation). 6 early 1960's CMRs to fill gaps in collection (eBay). Evergreen Jawa - A4 factory history in magazine format produced for 60th Anniversary. The Classic Motorcycle - February 2006 – 1960’s CZ250 and 360 MX (twinport, twinshock). The Classic Motorcycle - July 2006 - Jawa 350cc Model 579 (Swedish military model). The Classic Motorcycle - October 2006 - CZ 250cc Model 455 with PAV trailer. Motorcyclist (USA edition) - February 1965 Jawa 350cc Supersport Twin. Classic Bike Guide - May 2004 - 1958 Jawa 500cc Model 15 (Club Cooperation). TBM (Trial Bike & Enduro) - May/June 2004 - CZ 250 Enduro (Club Cooperation). Czech Motor Reviews - 3/58, 1/63, 6/63, 1/66, 2/66. Motorcycle Rider - May/June 2004 - 50 years of the UK Jawa CZ Club. Het Motor Rijwiel (Dutch) - Jan/Feb 1999 - Tony Bierman and his 1929 Jawa 500. Het Motor Rijwiel (Dutch) - Mar/Apr 2003 - CZ 150 Model C (1951 Pavinder). Het Motor Rijwiel (Dutch) - Jun/July 2004 - Eastbloc Motors Part 3 Czechoslovakia. Bromfiets (Mopeds) (Dutch) - May/June 2004 - History of Jawa Mopeds 1946 to present. Classic Motorcyclist - Feb 2004 - 1977 Jawa ISDT. Classic Motorcyclist - May 2004 - 1968 Italjet Jawa. Jawa California road test March 1968. Jawa 350 634 MCN road test 1974. CZ 250 Enduro MCN road test 1976. CZ 125 & Jawa 350 MCN road test 1975. CZ 250 MCN road test 1974 and 1976. CZ 175 MCN road test 1971. Riding a Jawa 350 634 in South America (MCN). Profile of Falta (MCN) – MX rider. Profile of Nunn (MCN) – MX rider. CZ 125cc - What Bike July 1994 - Owners Review. CZ 350 + sidecar - Superbike Feb 1984 - Trip to Czecho. CZ 350 racer 4 cylinder (Sept 1998) - Moto Storiche and D’Epoca (Italian bike magazine). Jawa 250 Six days (banana frame) (March 1999) - Moto Storiche and D’Epoca (Italian bike magazine). CZ racers part 1 Walter machines up to 1960 (Nov 1999) - Moto Storiche and D’Epoca (Italian bike magazine). CZ racers part 2 All other CZ's (Jan 2000) - Moto Storiche and D’Epoca (Italian bike magazine). CZ 175 (477) Efficiency Check - Motorcycling Monthly October 1977. CZ 175 (477) road test - Motorcycle Mechanics July 1977. CZ 175 & Jawa 350 road test - Motorcycle Mechanics March 1976. CZ 250 (353) road test - The Classic Motorcycle October 1996. The Manx Jawa (500R) - Classic Bike Guide April 1994. The Classic Motorcyclist - June 2000 - Model 11 & Jawa 250 + Pav trailer. 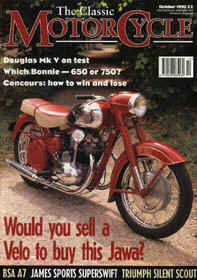 The Classic Motorcyclist - September 1995 - Britain's Oldest CZ – 1936 CZ175 Standard. The Classic Motorcyclist - October 1995 - Jawa 500 OHC – Eastern Blockbuster. Classic Bike - Italjet - Jawa Model 360 in Italjet frame. New Motorcycling Monthly - February 1977 - Road Test on the CZ 250 Sport. Motorcyclist Illustrated - October 1978 - Road Test CZ 250 Custom.